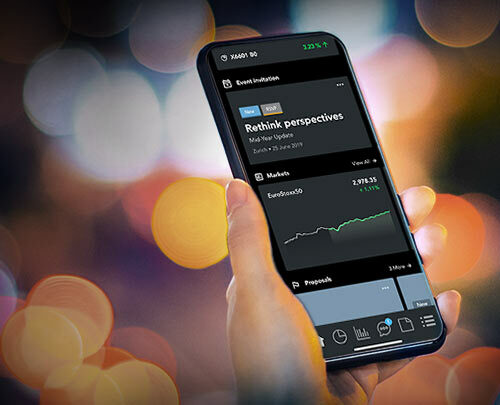 My LO puts Lombard Odier’s cutting-edge, in-house technology into your hands, in a user-friendly platform developed alongside our clients and our bankers. My LO offers functionality such as access to financial and market data, the ability to create and export a consolidated view of your portfolio, customised reporting and secure messaging. Depending on the profile defined with your relationship manager, you will have privileged access to Lombard Odier Research and to our publications, and will receive invitations to our events. My LO, track your wealth your way. With My LO, you can review your global portfolio at any time and from a variety of perspectives – with access available via smartphone, tablet or computer – at any place. You are interested in subscribing to My LO? Get in touch with your relationship manager. We will send you a connection kit as soon as you subscribe.